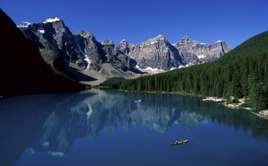 The Canadian Rockies are located mainly in southern Alberta and British Columbia. Five national parks are located within the Canadian Rockies, four of which interlock and make up the Canadian Rocky Mountain National Park. These four parks are Banff, Jasper, Kootenay, and Yoho. The fifth is Waterton which is located south of Banff National Park. The Canadian Rockies' physical appearance is different from the American Rockies because they have been very heavily glaciated, resulting in sharply pointed mountains separated by wide, U-shaped valleys gouged by glaciers. The highest peaks are between 11,000 feet (3,360 m) and 12,970 feet (3,950 m). The scenery of these parks is extraordinary. In 1984 the parks were declared a World Heritage Site for the unique mountain landscapes found there, comprised of peaks, glaciers, lakes, waterfalls, canyons and limestone caves as well as fascinating fossils. Canadian Rocky Mountain National Park Map, CR Banff Map, CR Jasper Map, CR Yoho Map, CR Kootenay Map, CR Waterton Map Move your mouse on the map then expand it.